A major part of the renovation process is shopping. For better or worse, there are so many products and finishes on the market that finding the right thing (for the right price) takes strategy. Unlike a shirt or a camera or a cell phone, you will live with your brick, roofing, cabinets, countertop, and tile choices for decades. Read on to learn how we tackle the biggest shopping task most people ever face. 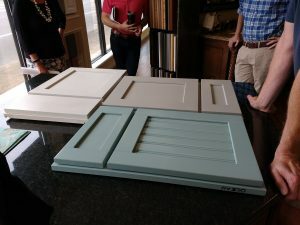 Though I’m sure your first trip to a cabinet shop will be overwhelming, this decision is often the easiest to make because there are fewer options. If you can decide between a simple, clean line cabinet versus an ornate traditional one and then pick between stained and painted, you’re well on your way to making a choice on cabinets. Cabinets are also a good starting point because they’re typically a huge fraction of your overall kitchen renovation budget and they are very noticeable in the space – they have a big impact on the style of your kitchen. This is a natural next step after cabinets. 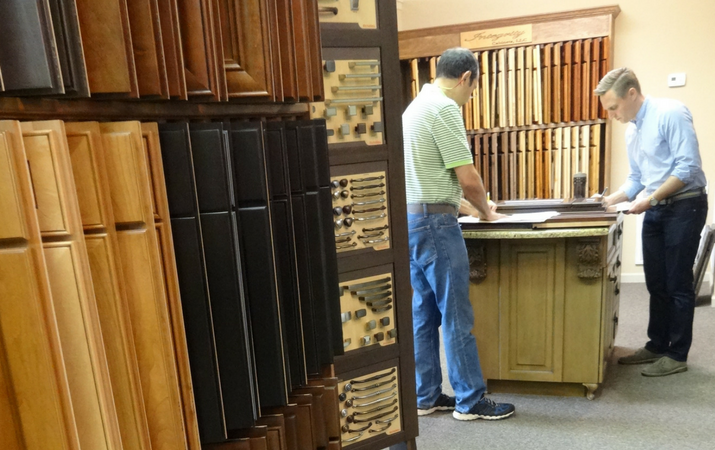 Be sure to ask your cabinet shop for a sample of what you chose (or your top contenders). 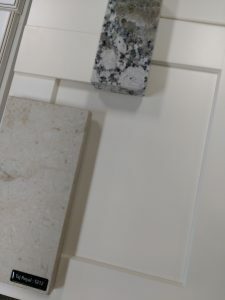 Countertops are another product where clients often have a few preconceived notions about performance and appearance that can aid the decision. So you may already know if you want to consider budget options like tile, laminate and solid surface. Or if you’re going straight to the stone yard to check out granite, marble, and quartz. 3. Plumbing fixtures & appliances. This is where shopping for your renovation starts to feel more like a traditional retail experience. With our clients, we often visit the local plumbing and appliance showrooms as well as the big box stores. Since plumbing fixtures and appliances come in a limited number of finishes (white enamel toilets, tubs, and sinks, stainless steel, chrome, oil rubbed bronze, brass, and a few odds and ends), this item makes the most sense to tackle next. Note: if you think you may want an appliance that’s not a standard size, it’d be wise to pick that before shopping for cabinets. It’s not always critical, but there are sinks and stoves out there your cabinet designer will want to plan around. Prepare for information overload. The lighting industry is not far behind the fashion industry in terms of trendiness and variety. 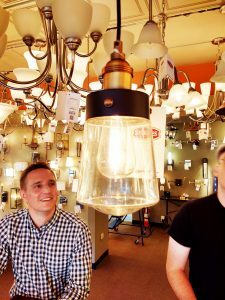 It’s very helpful to already have an established aesthetic before you visit the lighting stores (hence, all the selections you made in steps 1-3). There are tons of great online lighting retailers as well. But we do recommend doing a little bit of light shopping in person since color rendition and glass characteristics are often not accurate on your screen. This is another product family with roughly a gazillion options. That’s why we put it next to last. 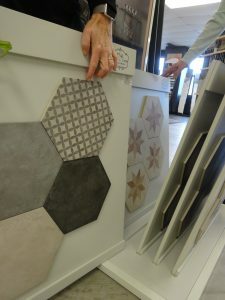 You can head to the tile shop with your cabinet and countertop samples in-hand. Because there are so many tile options, you have an opportunity to save or spend in a big way. If you do your tile shopping toward the end, you are already painfully aware of how much money you’re spending elsewhere and are better prepared to choose a budget-friendly option if needed. Conversely, if you’re right on track with your budget, you can feel comfortable falling in love with a pricier, handmade tile. Flooring (tile, hardwood, laminate, carpet, roll-goods) is similar. Save it to last and it’s much easier to narrow down the options. Handles, pulls, knobs, and shelf brackets are relatively easy to tackle once you have everything else in line. They come in any metal finish you can imagine, so it’s easy at this point to make selections that harmonize with your cabinet style, colors, and other metal finishes. Finally, at the end of the list is paint. With literally millions of options out there, it’s a big help to have your more limited selections (items 1-6) made. Now you have a nice pile of product samples against which to hold your favorite paint chips and make a confident choice. Paint is also the easiest to change, so it’s less critical than the other items on the list. Because renovation shopping can be such a time-consuming task, it’s best to set yourself up for success by bringing a few pertinent items on your shopping trips. Bring a tablet or print out some photos of your space. If you’re working with an architect (bonus points! ), you can bring perspective views of the design or interior elevations. Salespeople really appreciate seeing the space so they can steer you towards appropriate products. Know your measurements and quantities. If you’re looking for tile, try to have the basic square footages worked out. Maybe you want one tile for the floor and another for the backsplash. Calculate these areas ahead of time (length x width, for those who’ve slept since middle school math). For cabinets, measure the linear feet of wall against which cabinets may be placed. Be sure to take note of doorways and low windows. Overall dimensions of the room are always helpful. Show your salesperson some inspiration images. Put that Pinterest or Houzz account to work! Bring some pictures you like and ask a salesperson to show you something similar. Pack a tape measure. Especially when furniture or salvage shopping, it’s handy to be able to verify an item will fit in your space. Here are a few questions that will help you get the most out of your shopping trips. Do you take appointments? Unless you’re just casually browsing for ideas, try to get an appointment. Having the attention of a dedicated salesperson means you can make a lot of progress in an hour or two. That person can navigate the options quickly and may be able to show you clearance items, floor models, and returns in the warehouse. Can I get the same result for less money? I pride myself on serving as my clients’ budget police. Whenever I’m shopping with a client and we find a product they like, my next question to the salesperson is, “Do you have something similar at a lower price point?” I try to be really specific. If it’s the color they like, I ask to see budget friendly versions of that color. If it’s the size, that’s what I’ll point out. Once you have a direction, the path is clear to ask about price alternatives. What’s the lead time? If your project is currently under construction or you will be starting soon, be sure to ask about lead times. Especially for unique or handmade items, production and shipping can take 6-8 weeks or more. Better to know the product will slow you down before you fall in love with it. Do I have to use your installers? Certain vendors (tile shops, for example) may prefer to have their own team do the installation. This isn’t common, but it’s best to ask. Installation is often the lion’s share of the price tag. And if you’re working with a general contractor, you need to make sure they’re okay with an unknown team doing a portion of the work (they may be very glad about it if it’s a speciality item and the vendor has more expertise). What do other customers say about this product? This is a great question to ask because the salesperson’s answer will let you know how popular the product is (maybe you’re the first person in town to buy it) and whether they’ve had the product returned often. I find this question especially helpful with appliances. If a salesperson if offering you a ton of upgrades and you don’t know how to decide, ask them what percentage of customers opt for the upgrade and how do they feel once they get the premium item? If I were flipping a house, would you still recommend this to me? This is just a more creative way of asking for a budget option. But I find it enlightening to ask a salesperson whether this product is a premium price because it will last forever and if there’s a cheaper alternative (that might be great if you just really don’t want to overspend on your project). Can you give me a sample? Most stores have finish cards or product samples they can share with you. Tile samples are often on loan, whereas cabinet vendors will have wood color chips you can keep. Collect as many samples as possible so you can reference earlier choices as you shop. Being too bargain happy. I’m the last person to encourage you to spend a ton of money. However, there are some bargain products that aren’t as good a deal as they seem. One example we’ve encountered before is tile. Closeout tile often does not come with edge options like bullnoses, pencil trim, or through-body color that make it easier to turn corners. Unless your tile runs wall to wall, you’ll need to stop that tile somewhere and you don’t want an ugly, unfinished edge sticking out in your nicely remodeled space. High pressure salespeople. This is true with any type of shopping – if a salesperson is pressuring you to buy the same day you walk into the store with no chance at comparison shopping, walk away. When you’re shopping for a construction or renovation project, those products are just too expensive to let someone strong arm you into making a quick decision. 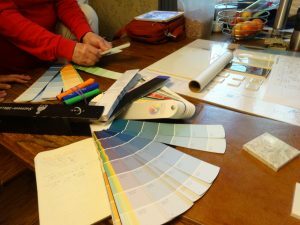 Salespeople in this industry do a lot of work to get the sale (cabinet designs, tile layouts, lighting spec sheets, etc.). But, remember, that’s just part of their marketing budget. They have to generate a lot of quotes for some of those to turn into sales. Don’t feel obligated just because you asked for a quote. Do your part by not asking salespeople to design options for you unless you’re serious about purchasing. But an ethical salesperson will completely understand if it doesn’t work out. Renovation and construction projects are time-consuming enough. Help the process go as smoothly as possible by following a plan. Like this advice? Let us know how it worked for you to “shop like a pro” in the comments below!